This morning's Journal looks at the County Legislature's disagreement over budget goals, highlighting two Dryden legislators, Martha Robertson and Mike Hattery. Somehow the Journal lost track of party identification, and lists Hattery as a Democrat when he's definitely a Republican, and does the same to Caroline and Danby legislator Frank Proto. The article also notes the retirement of Dryden resident and County environmental health director John Andersson after 30 years of service. Members of the community have also been killed or seriously injured by drunk drivers, and far too often. These crimes are preventable when treatment court works. What is at stake in treatment court is the very lives of both the addicted and their future victims. In the print edition, but not online, Varna resident Pattie Mahler questions the concurrent 25-years-to-life sentences recently given to Jacob Carter as too light a punishment for the crime committed. This morning's Ithaca Journal brings two letters to the editor from the conservative side of the political spectrum. Edgar Seymour of Freeville calls for the prosecution of Speaker of the House Nancy Pelosi for her recent trip to Syria, while Robert Romano writes to blast an earlier commenter on gun laws. At the county level, the Journal's editorial calls for a tax levy budget goal, and there's an article on the county's drug court. The print edition is strangely large, as if they were expecting a lot more news that didn't come, and filled it in with AP stories. There's a lot of state news, including an article on Assemblywoman Barbara Lifton's introduction of a bill that would let state employees sue the state government for discrimination as employees of private employers can. The expanded section is a great thing, though I'm wondering how it happened. Christopher Ackley's dream of a skate park for Dryden was realized Saturday as the Town and Village of Dryden celebrated the opening of the Christopher Ackely Memorial Skateboard Park in Montgomery Park. There was a ceremony and skateboarding. The park will officially open for business June 4th. Demand for ethanol seems to be increasing the price of everything farm-related. Farmers' opinions seem mixed. The former Ellis Hollow Community Church is undergoing major conversion into a large house for rent. The original structure will remain within its current footprint, as required by its historic designation, but with a very different interior. A second building behind the old church provides a garage and additional apartment. 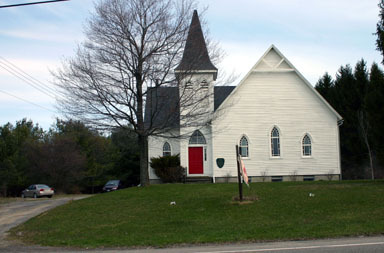 Ellis Hollow Community Church, in 2004. The Journal's editorial reflects on hunger in Tompkins County. Cathy Wakeman's Dryden Town Talk reports on the Dryden Grange's giving Cam Viall their Grange Community Service Award. The mother of 10 children, Viall helped run a variety store, has been active in the American Legion Auxiliary, and worked as an election inspector. The Grange also honored the "My Brother's Keeper" quilt group for their work in making 2200 quilts (supplemented with supplies) for Cortland and Syracuse rescue missions. This Saturday will be busy, as Wakeman reports on the bike safety rodeo from 9:00am to 11:00am at Dryden Elementary school, and a Boy Scouts barbecue at Clark's. The Dryden Middle School/High School art show will be next week, opening at 5:00pm on Tuesday, and the "Hearts of Gold Worship Dance Team" will visit Holy Cross Church on George Road next Saturday the 19th. There's a report on the many problems with Empire Zones (and Industrial Development Agencies) across the state. Dryden's two zones are too new to be included, and I really hope the Tompkins County board learns from these problems elsewhere. On the opinion page, Joe Laquatra of Freeville calls for Vice-President Cheney's impeachment. The Journal's editorial wades into the minefield of government consolidation, citing the potential for 10% savings on local government based on a study comparing Long Island to Northern Virginia. The headline talks about "a cheaper form of doing business". Government and business have painfully different priorities. They're startled by the difference in the number of levels of government between Virgina and Long Island, but don't start to ask why. Worse, they don't pause to ask whether Long Island's ideal government structure looks anything like the right structure for an isolated college city surrounded by more rural areas. Even when they list the government structures in Tompkins County, they don't stop to ask if they're appropriate. They don't pause to ask what the costs of consolidation will be, except for "letting go of some local control". "Letting go" is not exactly a neutral phrase in this context. They stay at the nice happy abstract level, completely dodging all of the hard questions of which things get consolidated and why. Alternately, should schools run on a town-by-town basis, with Dryden taking in the whole Town of Dryden and shedding its territory outside of the town? 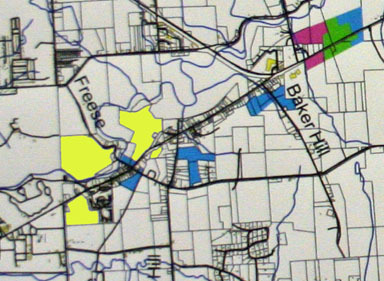 Should the Villages of Dryden and Freeville dissolve into the Town of Dryden? Should the Town of Dryden dissolve into Tompkins County? What happens to all of the water and sewer districts? Should the McLean Fire District, which crosses town boundaries, be dissolved, and its responsibilities handed to the towns? None of these are fun questions. I'm sure there are a few rootless people who don't care much what shape government takes, but I don't think making any of these changes is as simple as promising a 10% property tax reduction. A few years ago, the Town of Dryden secured a low-interest (2%) HUD loan for Cayuga Press to buy some new printers. It was part of the Town's economic development policy, though it came under some fire because of the family connection between then Town Supervisor Jim Schug (a Democrat, though his last run was as a Republican) and the company. This loan brought a lot of new jobs to Dryden for a few years, but now there's a problem. Cayuga Press has claimed all along that it moved to the Empire Zone in Cortland purely for space reasons, but somehow they forgot about the nature of the low-interest loan they had through the Town of Dryden. Now the town has to figure out what to do about that loan, especially since the money the town collects on that loan can be used to make additional loans for businesses (or possibly home improvement) in Dryden. Town Board member Mary Ann Sumner has a post exploring these questions on the Dryden Democrats blog. This morning's Journal looks at the increasing risks of what used to be routine traffic enforcement for the New York State Police, as more traffic stops seem to be turning into dangerous situations. The troopers down the road on 13 seem to be facing a more and more difficult job with every year. At the county level, a guest column explores how living wage jobs help not only their recipients, but the community as well. I've been neglecting Ithaca City School District news unless it had a clear Dryden connection, but I should catch up on today's editorial about the district's handling of racism allegations which follows on Tuesday's article on the incident, followup, and the state's opinion of it. Finally, applications for dairy farm relief are still available. The Town Board meeting stretched past midnight last night, for the first time that I can remember. It was a long meeting, though actually more focused than many recent meetings, and fortunately they took a five minute break at one point. David Perazone talks about natural gas exploration in Dryden. The board held two public hearings about unsafe structures. One property owner didn't come in for the public hearing, but Evan Carpenter talked the board into a six-month extension on a barn so that he can salvage timbers from it for another historic barn-building across the street. Grant money for that project seems to be coming through. Later the board scheduled a public hearing for another problem structure. The board went over change orders for the new Town Hall, spending some time contemplating a dedicated circuit for a microwave oven in the break room. The exterior of the building should be complete in 7-10 days, the sewage lines are in place - though not yet tested - and the place should, hopefully, be ready to open around mid-August. A furniture order is in the works and a call for proposals for telephone systems will go out shortly. The Dryden Youth Commission presented its annual report, combining reports from staff about programs with explanations of how the programs have benefited them from participants. The Emergency Services Committee reviewed some conversations with the fire companies, including questions about the budgeting and payment process, the frequently controversial question of what an "active firefighter" is, whether there might be contingency money available if fuel prices spike, and the possibility of two-year contracts. Anne Grant came to ask whether the Southworth Library booksale might be able to store its books in the old Town Hall when the new one opens, as they're having problems storing books all over town. She also asked if the board would be amenable to having a memorial bench put in the new Town Hall grounds in honor of the women who are sewing sleeping bags for the homeless. Dave Perazone of Mason-Dixon Energy came in to ask the Town Board about how to arrange a presentation about natural gas leases on town property, but gave a fairly detailed presentation while asking. Helen Mandeville spoke about her concern about the lack of connection between the town government and Bethel Grove, and brought a copy of the Town of Caroline newsletter for board members to look at. She also discussed issues with Six Mile Creek and culverts near the Dryden-Caroline town line. Joseph Solomon of 31 Lower Creek Road discussed cars that screw up the curve and land in his yard or house. A 15mph suggestion doesn't seem to be very effective. More enforcement, an extended guardrail, a reduced area speed limit, or a stop sign in both directions are options for changing the intersection, and the town engineer will look at the intersection. Highway Superintendent Jack Bush reported on the completion of sewer work for the Town Hall and the start of highway work. It sounds like lots of things are further behind than he'd like, and he proposed a change to the 284 agreement listing roads to be repaired. The new list avoids roads with rotting culverts, which will get repaired before the roads themselves. Recreation Coordinator Jen Dube had a flurry of appointments and contracts, and reported on the opening of the new skate park. Environmental Planner Dan Kwasnowski reported on progress toward a new stormwater management ordinance, a possible project for web-based mapping in Dryden, the Town's finally closing on a property above Route 366 that can be used for recreation, and the possibility of including stormwater information in a newsletter. He also encouraged the town to spend $3200 to apply for a state matching grant of up to $500,000 for work on the recreation land around the new Town Hall, noting that grading for playing fields could cost $200,000 to $400,000. RPM Ecosystems had its grand opening Wednesday, with several town officials present, though County Legislator Martha Robertson expressed her concern that RPM was selling trees retail from the Dryden location, something they'd said they wouldn't be doing when applying for grant money. The Personnel Committee reported progress on an employee manual, and the Finance Committee reported on work toward an in-house audit. There was also discussion of a town newsletter, hopefully in August and November. Town Board member David Makar talked about bringing Tompins County Area Development in to meet with the board about economic development and the revolving HUD loans. The Recreation/Youth/Community Centers Committee reported on plans for distributing 2007 funds to community centers. David Makar also proposed that the Town Board schedule two meetings a year away from the Town Hall to get closer to the communities they represent. Community centers and fire departments sound eager to have the Board visit. The pull of the new Town Hall seemed pretty clear, but the board did agree to meet elsewhere in July and work on having neighborhood meetings of some sort on a more regular basis. The big surprise: Town Supervisor Steve Trumbull declaring explicitly that he wanted to spend his last four meetings as Supervisor in the new Town Hall: "I'm not going to be here in January. I'm done." Long, but busy. Unfortunately, the Ithaca Journal wasn't there, but the Dryden Courier and Cortland Standard were. The Tompkins County Route 13/366 Corridor Study. The Comprehensive Plan took forever to get done, and isn't a perfect document, but I have to give its creators tremendous credit. They knew the place, both the terrain and the people, and held session after session of open meetings (Planning Board meetings, information sessions, and finally the Town Board process) where the public was welcome. The public didn't all show up of course, but it seems very clear that public input had a direct impact on that plan. I was a bit nervous about the Cornell T-GEIS. Cornell isn't exactly a gentle giant, and any time they propose expansion I look around to see what the impact might be. The first public meeting left me a little worried. The planners seemed interested in listening, but they didn't seem to know a whole lot about the area they were working on. The second meeting, however, showed that they actually were listening and ready to learn. They took concerns about transportation and proposed possibilities that reflected those transportation questions. Although it's a Cornell and Town of Ithaca project (with Dryden participating), they did a thorough job of evaluating Varna's problems with transportation and made substantial suggestions for addressing them. Not quite everything I'd like, but wow! It was clear they were serious about the roads and their impact. The last study, the Route 13/366 Corridor Study, was the one for which I had the least concerns and the most hopes. Unfortunately, the initial public session spent a lot of time determining that people prefer looking at farm fields and lawns to looking at asphalt, and then had a small amount of time for more detailed comments on the survey area. Those comments (571.5MB PDF) had a lot of good detailed information about the road, but when I showed up at the second public information meeting (and likely the last one) there was very little to see about the road, and an awful lot of land use description done around it. The comments from the first session seemed to vanish into an effort to rewrite the Town Comprehensive Plan's approach to Route 13 with something very different. Rather than strengthening downtown Varna, a node now entering its third century of existence, they marched east to plant a new node east of NYSEG. Around Varna, they scattered development on the hillsides, avoiding even the question of whether using some of Cornell's land could strengthen the existing Varna node. (I'll write more about this soon.) They concentrated as much development in the Village of Dryden as they could, to a degree that seems to make Village residents (that I've heard from, anyway) gasp. There wasn't a whole lot about the road itself, except for some new infrastructure to support the new node, a divider in the 13/366 overlap, and some traffic circles that seem likely to create even more danger than presently exists. Transportation? Why talk about transportation? None of these plans are perfect, but the first two felt, well, more honest. Their creators seem to be listening, and both plans deliver something much like what their title promises. The last one, though, seems to be off in its own strange place, creating new suburbs while not doing much to preserve or fix what we already have. I've criticized the Route 13/366 Corridor Study for ignoring the existing Varna node in favor of looking further east, around NYSEG. Based on conversations I had at their April presentation, it seems pretty clear that the planners automatically removed all Cornell-owned lands from consideration for development. Varna has some basic geographical problems: it's trapped between a hill and a creek, with a heavily-traveled road going down the middle. Its other problem is that the remaining usable land is owned by Cornell, as research fields and nature preserves. While I don't have any great desire to obliterate Cornell's "outdoor classrooms", it's very strange to me that a plan supposedly about strengthening nodal development would ignore these properties completely. The map below shows the 13/366 planners' original development thoughts, plus some additions reflecting open space around Varna. Blue is the planners' thoughts on new residential, green is new commercial, and pink is industrial. The bright yellow is opportunities I think they should consider. Should all this be developed? I don't think it's necessarily a great idea, and I'm sure the neighbors would have a lot to say about how it should be developed if it were to happen. Still, this could be a great option for pedestrian-oriented development with enough critical mass to create commercial opportunities, if it was done right. At the same time, though, I think any plan that claims to be strengthening nodal development needs to consider these options seriously. Cornell seems quite capable of standing up for itself, and if these plans are really only theoretical anyway.... why not? The Ithaca Journal opinion page has a letter from Thomas Pirko of Dryden about the challenges of notifying students in case of emergency. Also, on the opinion page, Jay Gallagher provides a cynical glossary of Albany vocabulary. 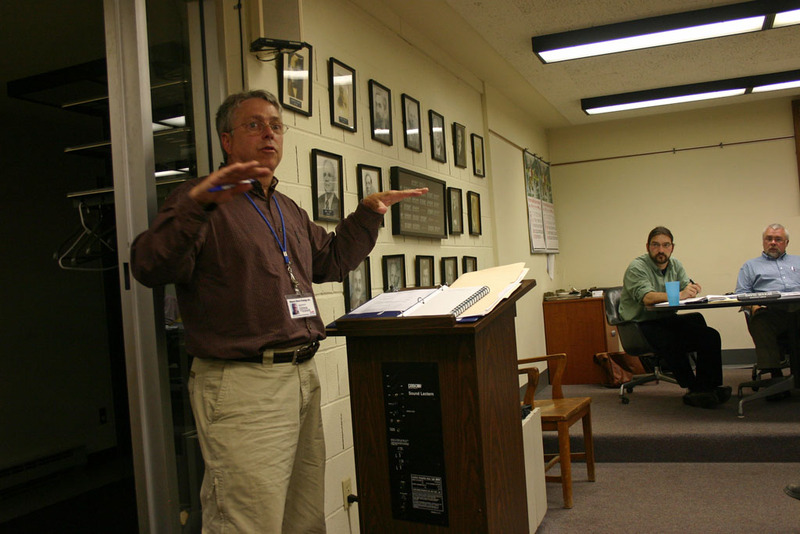 The Dryden Democrats will be meeting Wednesday, May 16th, to discuss the 2008 presidential race. We had a great conversation two months ago, and hope to see new and interesting angles that have emerged since then. We'll meet at 7:30pm at the Dryden Town Hall, 65 East Main Street (Route 392), Dryden (map). All local Democrats are welcome to attend. Peter Schug of Cayuga Press and his attorney Jonathan Orkin came in to discuss the HUD loan that is now in question because the company has moved its operations to Cortland, including the piece of equipment the loan was for. I'll cover this in more depth in a separate article. I also posted a 14.8MB MP3 recording of the conversation. The recording is necessary, I think, to understand the tone of the conversation, but I've also had it transcribed for people who want to glance through it. I'll save my own opinions of the conversation for the end - I definitely encourage readers to listen to the recording or read the transcript to develop their own conclusions before encountering mine. Peter Schug: Good evening. Thanks for allowing me to come and speak. I asked Jon Orkin to join me. I believe everyone on the board when we did this wasn't here. So if there are any questions that I might not be able to answer, he was involved with all the paperwork and the goings on in the process. So I thought it wouldn't be a bad idea to bring him along. So I'm going to talk a little about what the future is with the HUD loan as it relates to Cayuga Press and see what we can do to put this to rest and move forward. Marty Christofferson: What's his role? Peter: Jon is our attorney. Peter: And he was obviously responsible for all the paperwork with the original loan and all that. Marty: I have some questions about the original loan and just how you went about getting it. It was HUD money right? It wasn't money that came out of the town coffers? Marty: And it was a HUD grant, but the town is a sponsor for that or something? How does that work? Jon: The town is the recipient of the money. It came from the federal government - HUD. We went through our application through the county. We were fortunate enough to receive it. The conduit for us to get the money is it came through was the town, meaning that they are the recipients of the federal money once we pay it off. Then it becomes money for the town to use for other projects in the future. Marty: So because you initially filed the paperwork to get the money from the Feds, you came to us to deal. Marty: When you pay it back to us we don't have to pay the Feds back. Jon: Correct. If we had been in Lansing, Lansing would be getting the payments and they would have the money to use in the future. Marty: So because you took the initiative to do this, the town is benefiting. Jon: No, it was an ad in the paper that we saw. Marty: And it cost a fair amount of money to do that. Peter: It's a long arduous process getting through there. But we did it together with the town board that was there. Steve: Are you in the town of Cortland? Peter: City of Cortland, yes. Steve: OK, so it's not a town too? The city is not inside the township? Jon: It's a city within a city. Steve: OK, does the city of Cortland participate in HUD loans at all? Peter: No. Not that I know of. I don't know. Steve: I'm wondering if you could do the same process. You could pay your loan off, and then get a HUD loan through them and take nine or 10 or 12 years to pay it off. And when you get the money you can give it back to us. I could give you the eight or nine or 10 years to pay off the same amount of money. I just wonder if that is possible. I don't know. It's just something that occurred to me. Jon: I don't know. Like I said, this went through Tompkins County. I did this through the county offices. Mary Ann Sumner: I'm sorry. You got the grant or the loan about five years ago, right? Mary Ann: And when did you start looking at moving? Jon: That's not fair. That's just not fair. Mary Ann: Well, I'm sorry. It is a question. Jon: Quite honestly, Cayuga Press really didn't start - the answer to the question is that Cayuga Press. I don't know how to answer the question. We have been trying to move for years. Peter: We weren't looking to move. We have needed more space for probably about three to five years. We had wanted to find something or build something in Dryden. That was our first choice. This building became available in Cortland. We literally had to blow up walls and were stacking jobs on top of each other. I finally just said this is ridiculous. We can't operate. We can't hire more people. I have no room. People did not have places to park. I had to do something. Mary Ann: I understand. You explained it to us. Peter: So as far as moving, that came up a few months before we did. Jon: It was a difficult process. We did not want to move. It's that simple. Mary Ann: I understand. We have talked about this before. But I am thinking that when you got the loan, you understood that the contract said that if you move that is a default condition. Mary Ann: It's in the loan agreement. Marty: It says the town board has the opportunity to review it. Mary Ann: Have you read the loan agreement? Marty: Yes I have. The whole thing. OK? Soup to nuts. And we have the opportunity to negotiate and work with that. We could call the whole thing right now if we wanted to. Or we could work and leave the loan as is. Marty: So it is up to us to decide. Marty: So whether it is default and demanded right now, I think that is different than saying we have the opportunity to work with some people in the community who have been here a long time, developed a lot of jobs. They're the ones who initially put the time and energy into getting the loans to begin with. We had nothing to do with that. Mary Ann: I understand that. Marty: So I don't know why we are trying to not work with these guys. Mary Ann: I'm having a problem with the idea that this came as a surprise to Cayuga Press. It seems like it was part of their plans. Jon: Wait a second. Can I answer that? Let me answer that. First of all, I don't gainsay for a second that under the actual terms of the loan document, the loan security agreement, that if Cayuga Press moves its base of operations, then that constitutes a default. You are correct. But when you get to the default provisions of the loan security agreement, what the town can do with it is entirely discretionary. You can go from A to Z, from a regular house closing with a due on sale clause, you may have the entire amount due or you could do nothing. All I just want to say is - I was thinking a lot about this. To say that it came as a surprise - it certainly did not come as a surprise, because Peter came to the town board. It wasn't to this town board, but he came to town board. He discussed it with them. He said right out, "I want to talk to you folks. I want to try and figure out a way to resolve this". And it dragged on and it dragged on and it dragged on. The point is this. I'm a football fan. The Baltimore Colts are run by a guy by the name of Art Modell. One night Art Modell backed his tractor-trailers up to the Baltimore Colts offices, took every helmet, chute, and carted them to Indianapolis. Now that's a relocation. This too is a relocation. But there is relocation and then there is relocation. If you take a look at what has happened here, how many of the Dryden residents who received jobs pursuant to this HUD loan, still have their jobs? I believe the answer is all of them. All of those jobs for low-income families have been created by this. They moved five miles away. Mary Ann: Jobs in Cortland are not the same as jobs in Dryden. Jon: But see, that's - I don't know what that means. I read your blog. And I understand it. No, I'm a good Democrat. I read the blogs. Jon: Yeah, what do you want? But my point is this. 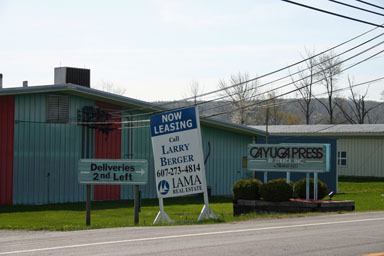 The Cayuga Press moved as the crow flies maybe five or six miles from here. David Makar: They tracked the driving mileage from the previous location to Cortland as 17.46 miles. It is a 25-minute drive. David: So it's not five miles. A 25-minute drive is not five miles. Mary Ann: You understand - I mentioned that in the article, too. Jon: I know, I hear you. And you were very fair. I think your issue was these are Cortland jobs. And that's what I take issue with, that the Dryden residents who had jobs created by Cayuga Press by this grant, and the Dryden residents who had jobs created by Cayuga Press still have those jobs. All I'm asking, and I'll finish, all I'm asking is that if the action that you take does something that causes Cayuga Press to restrict, to cause an economic burden during a time of their transition, which is a tough time for any company, the downfall of that may affect Dryden residents. That's what we don't want to have happen, that's what you don't want to have happen, and I hope that you just take that into consideration. It's not the mileage that's the issues. These Dryden residents are earning money, they're paying Dryden taxes like they always have. David: Are you suggesting that if the loan was called you'd have to fire people, you'd have to lay people off? Jon: I'm not saying... I don't run Cayuga Press. I'm saying that any time you ask any kind of commercial entity to immediately come up with $250,000, that's going to cause a hardship. David: And that's why we haven't asked them..
Jon: And I appreciate that. Mary Ann: Recognizing that Peter is a Dryden resident and he's been able to keep the Dryden employees is why we've extended, we're saying we're won't even consider calling it for a year. Almost a year now, because time is passing. There will be 90 days notice on top of that. We're not talking about immediate. Jon: We're not here to do a public negotiation or to talk to you about those terms this time here. All we're asking is: "What is the reason behind calling the loan due? What is the reason why they extended the 90 days? Is it punitive? Is it, what, I don't know. Mary Ann: I'll tell you, I'd be happy to explain it. There are two issues. One is that it's very low interest. It's less money than we would be making on an equivalent amount of money in the bank. So there's a consideration for raising the interest rate. The other consideration is that we have people looking for economic development loans, and we will be advertising soon the availability of money for economic development loans also and we would rather give the money to somebody who's doing business in Dryden. We're willing to not consider it for almost a year now because it will take us that long to get through this process. And, if we do get an applicant we'll let Peter know and there will still be a 90-day window to resolve it. The issue is the low interest rate and the interest in making the money available to Dryden businesses. Marty: How has that negatively affected Dryden, though. How has that - I mean - how has it negatively affected Dryden? Mary Ann: It's not positively affecting Dryden. Marty: I didn't ask that. It's that how is it negatively affecting? Mary Ann: Because the money is not available to Dryden businesses and because we're making less money on the investment than we would be if it were in the bank. Mary Ann: Sounds like two negative effects to me. Dan Kwasnowski: How much sales tax did you get though, with those people living there, buying their groceries, getting in their car and buying their gas over the years? These guys are doing business. Dan: We made money off this. Marty: I don't know why you guys are so after these people. Mary Ann: But not any more because. Martha Robertson: This is a program that Tompkins County Economic Revolving Loan fund that the county actually does a lot of the paperwork in the administration, and then hands it off to the municipality for the paybacks. Marty: Did the money come from the county or did it come from the federal government? Martha: The administration and the paperwork and recruiting, all of that comes from the county. Marty: So processing of it came from the county, but the chunk of money came from the Feds. Martha: But this is a program that the county operates in either [crosstalk]. Marty: But now we operate it. I mean you passed it to us and now it's our burden, right? Martha: That is part of the service the county offers. Marty: So what's your point? Marty: I'm just trying to see where you're going. Martha: I'm getting to my point. If you saw the Ithaca Journal today, somewhere in the intersection of the first section there's a very significant article about Empire Zones and industrial development agencies in New York failing to insert what's called "fall back provisions" when they give tax breaks and abatements and etc. to businesses that promise to produce jobs and then don't. In many cases they even just sort of reorganize and change their name and call it a new business and say: "We're bringing in new jobs." They get tax breaks for this and because of a good old boys network or whatever they don't bother, if somebody doesn't produce, they don't bother to call back the loan, require the tax abatement to be paid back. That's not true in Tompkins County, I can promise you that. What bothers me here is that, this is town money, this is my money, this is your money, this is everybody here's money that was loaned in good faith and now we're actually losing money on it because of the low interest. As Mary Ann said, if it only sat in the bank that's town money we could be making interest on. So, I think it's a very generous offer to have this extended time period and let them pay it back but raise the interest and have a 90-day clause. I think that's extremely generous. It just makes me wonder if there is some promise before you move, Peter, that: "Oh well, you won't have to, we won't make you pay the loan back." You had to, I'm sure, figure into your business plan when you moved, the possibility you'd have to pay the loan back. I mean, you had to figure that in. Peter: I'd never said that I didn't. That's why I came to the board to discuss it. What I am saying is that..
Martha: So your business plan includes the possibility..
Martha:...that you might have had to pay the loan back. Martha:...and therefore it was still worth it to you. Marty: Martha, you should really be addressing us. Marty: I don't think it's appropriate that we get into this kind of conflict. And I'm not sure what you mean by the good old boys network, because I don't know of any good old boys network. I think that the examples that you gave in the Ithaca journal aren't appropriate here, because jobs were created. So, I'm not sure, again. Martha: The point is that is the original terms are not being.. yes. Marty: I'm not sure why a small group of people is really after Cayuga Press. I don't know what's going on here. I'm all for raising the interest rate some, and I'm all for having a shorter term, but I think we've got to do something that gives these guys some kind of business plan to work with. David: The resolution we passed last month was twelve months and now it's the earliest we can call it, that would be 90 days, plus 15 days. Marty: You passed a resolution, or you proposed it? David: Yes, we passed it last month when you weren't here. David: And we passed it at the 4% rate. Mary Ann: And presumably you heard us say that that proposal was not reasonable? Marty: Was there a resolution? Steve: There was a resolution of 4% to eight 1/2%. Mary Ann: No, from 2% to 4%. Steve: Yes, up to 4%, now 4% not 2%. Peter: No, I'm sorry I wasn't notified about that. Mary Ann: Mahlon, Mr. Shug says he wasn't notified of the resolution we passed last month? Mary Ann: OK, and you sent that to..? Peter: I haven't received anything. Mahlon: Didn't I send it to you? Mary Ann: All right, but you were informed of the idea, OK, let's call it an idea, yes? Jon: Yes, yes, I was. Mary Ann: And it was my understanding that you were objecting to that idea, am I right? Jon: But I think what I'm hearing is not the percentage as it is the term. Marty: Is it 16 months or 90 days? Mary Ann: It's a year plus 90 days. David: So it's 15 months from April. So the earliest that you'll have to pay us is July 9th, 2008, in full. You would have an increase in the rate from 2% that you pay now to 4%. Mary Ann: If a year from now we have an applicant for the money, we could give you 90 days notice to repay. Is that right? David: That's the earliest we could ask for. If another business says: "We want the money, we're trying to grow our business." Or there's three businesses that want..
Mary Ann: We wouldn't dream of saying that. Peter: Excuse me, just a minute please. We're also maintaining jobs in the town of Dryden still between our office in Dryden and the Mailbox of Ithaca, which is a sister company. We're still operating, we still own the buildings that are there. We didn't pack up and dump on Dryden. And I feel that, quite honestly, what you're doing here is more, it feels like it's a punitive damage because I took a piece of metal that HUD said that we could put in the Town of Dryden and create jobs with, and I moved it down the road. Those jobs are still there with it and really, the only thing, the only obligation I'm missing here, is I moved that press to another place. Mary Ann: And that there's 35 people that were working on it. Mary Ann: Excuse me... felt that it was a reasonably generous offer because you're a Dryden resident. Peter: I disagree, I don't feel it's generous. It doesn't. To me... we have nine years on the term. Mary Ann: The option, the extreme option, is to call it immediately or raise the interest to 8%. You know, it's not that bad. David: But if you were going to grow your business and you wanted to buy the same, this equipment..
David:...and you wanted to get the loan for $250,000 to do that it would be a 7.75% loan. So, maybe you'd make the business decision not to do that. Or maybe you'd say: "I'm going to make this investment at 7.75% because it's going to help my business." Now the town has given you, the town through the government has given you a 2% loan. We're asking to bring it to 4%, which is less than what we'd earn in a CD. Peter: I have no issue with the increasing it to 4%. I think that is very generous. I understand that. What I have issue with is, I'm trying to run a business, I'm trying to maintain jobs and I can't.. if a chunk of the money that we have out there I can't just anytime have somebody say: "OK. I guess we want our $250,000 back." It just isn't that easy. We just built a new building, added a lot of stuff. We're leveraged to the hilt right now. We have a huge amount of debt. Reality is, like you said, next April: "We'd like $200,000 and some thousand dollars right now, as somebody else needs it." Steve: What would you feel like in two years and probably six months? Would that.. I'm trying to figure..
Marty: I mean, do you have a term that's better for you? What would you counter...? Steve: But we wanted something..
Jon: I don't know the town law. We can go to Mahlon. Is there a way that we can discuss this with Mahlon? I mean, we're talking about his business here and it's difficult to open his business to the whole world and have to... I feel uncomfortable with that. I don't know if it's a violation of the Open Meetings Law. If we can present proposals through Mahlon, or I can do it. Mary Ann: I think it's got to go to Steve. Jon: Can we do that? Jon: And I thank you for the offer. Mahlon Perkins: Any decision is going to be made in public meetings. Jon: Fair enough. I just don't want to talk about the business of Cayuga Press. I just have to comment on one, do you mind? I know you guys are here forever and are going to be here forever, so I apologize. I have to take exception to something that was said here, and it was something that you, I'll call you Marty, I don't know you well enough. They created the jobs they were required to create. They still have those jobs, and we don't want to lose those jobs. So, this kind of image of something nefarious going on, that didn't happen here. Everybody knows we've always been open and said what we're doing. That needs to be said as a matter of record. We never tried to put over anybody on anything. Marty: I know this family really well. Mary Ann: You don't have to talk to me about this, Marty! I totally sympathize. Jon: Now, We've been here for two weeks, three weeks, maybe, since I've talked to Mahlon. Mary Ann: Well, yes. There's part of the problem, right. But it's not a punitive issue at all and I'm not... I don't believe anyone here believes there's any backroom dealings at all. I just want to move on and get it settled. Mary Ann: And I don't understand why it's talking so long. Simon St. Laurent: I guess I'd like to point out to Councilman Christofferson that saying that he's known these people for years doesn't do a whole lot to dispel the notion that he's trying to dispel, that there's nothing going on. Simon: And I'm trying to picture myself going to the bank and saying: "I have a mortgage on my house, but I'd like to move the house. Can I keep the mortgage with it?" Marty: The bank's happy to make you a mortgage. Simon: Marty, Marty, all I'm saying is..
Marty: And I don't like you telling that kind of story here, cause it's wrong! Simon: You're the one telling that story. Marty: I'm telling you I know these people like you would know these people if they were in your neighborhood. If they lived in your neighborhood you might know them and have a better sense of what's going on and the kind of business people [crosstalk] I don't like it, Simon! Simon: Marty, I'm suggesting that you not raise your personal relationships when you're talking about it. Marty: We live in a small town, we know a lot of people! Steve: Thank you for your time. Steve: Town Highway Superintendent, Department of Public Works. A negotiation over terms that Cayuga Press doesn't sound like they want to have in public. That said, there may well be room for compromise. The good news for Dryden in all of this is that a higher interest rate would eventually lead to more funds available for economic development in Dryden. If Cayuga Press keeps up on its payments, Dryden will make a lot more from a loan in the range of 4% to 7.75% than it would have on a 2% loan. At the same time, though, Schug's description of the financial state of Cayuga Press isn't exactly the highly stable and profitable story that lenders generally want to hear. Whatever the undisclosed state of Cayuga Press's finances, this story that seems more likely to win sympathy from a friendly board than to win credibility with the cold eyes of lending institutions. How much of a lending risk is the newly extended Cayuga Press? In the end, it seems that the question will come down to whether the Town Board thinks there's more to be gained for the people of Dryden by extending this loan under different terms or by calling it back in. Given that there is no dispute that the terms of the contract have been violated, it's clearly up to the Town Board to find that balance. The Journal does list the polling place for Dryden schools - the Middle School High School Auditorium, from 7:00am to 9:00pm. That editorial combined with their failure to list ISCD polling places makes me think I'll be voting Yes today. I haven't followed school budgets closely this year, so was planning to make up my mind this morning while reading their paper. Oops. 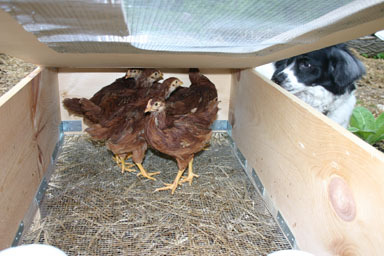 Last time I reported on the chicks, they were sprouting feathers. I should have taken some pictures of their vulture-like phase, but didn't. Chicks with feathers, and an inquistive dog. They're not pullets yet, but they're getting closer. Their big adventure today was leaving the house - they're large enough now that six of them is not a pleasant thing indoors. 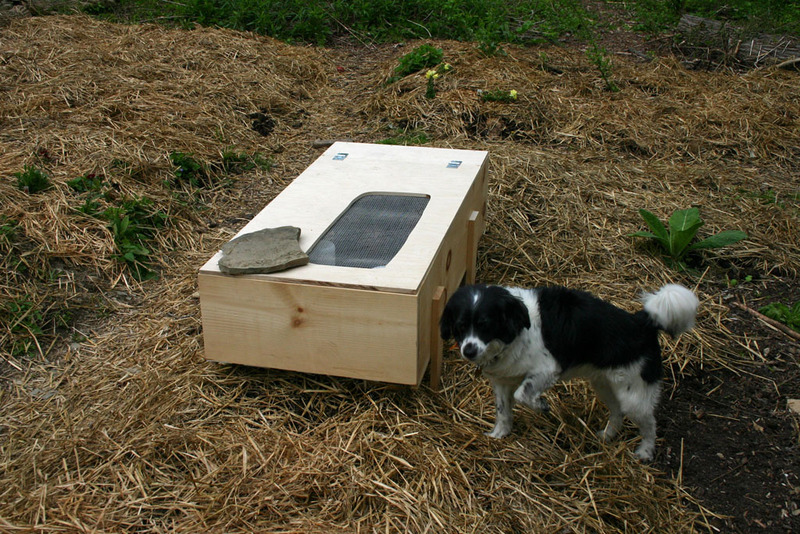 They're still in the box, but now they're fertilizing a bed in the garden, which will eventually grow tomatoes. Brooder box in the garden. In the long run, they'll be living in the front yard, with a proper coop and some fences, and maybe go out for expeditions sometimes. For right now, though, it seems like it's time to expose them to the natural changes of weather outside, though we put a lid on the top door for tonight's rain. I'll also be changing the box to give them more room to stand up - I think the ceiling's a bit low for them now. This morning's Ithaca Journal leads with a terrible story, a a 2-year-old held underwater by her babysitter on Ringwood Road, and the update reports the girl has died. I thought 2007 had started horribly, but it doesn't seem to be improving. I don't know what to say. A Cornell facility in Dryden, the Dyce Lab on Freese Road, is highlighted in an article on the colony collapse syndrome striking thousands of bee hives. The Ithaca Schools are preparing for a second budget vote after Tuesday's vote rejected the first. The County Legislature voted to support legislation aimed at keeping trash hauling trucks off local roads, and to request an extension from the state legislature of it's extra 1% sales tax. While I don't mind the general idea of having a second body look at tax rates beyond a certain level, it's another tie forcing county government to be kind to state legislators or suddenly find themselves short of cash. I didn't get to yesterday's paper, but there were some Dryden items. TC3 gave nursing degress to a record class, the Dryden school budget passed, and the county sorted out funding for emergency responder communications equipment. My name is Dave and I'm blogging for Living in Dryden on special assignment. Simon and his fiance Angelika got married this afternoon (Saturday). Later this week they are off on a multiple week honeymoon and vacation. Simon asked me to contribute to Living in Dryden while they are away. I will do my best. I figured I would start with a post in a new category called "Simon's Life". Simon and Angelika invited me and Arjan to witness their wedding and to take part in their reception. Simon doesn't talk too much about his personal life on this blog, but he does live in Dryden and his marriage and wedding are to be celebrated. Leave some comments for Simon and Angelika if you wish. I'll try to post here and at Dryden is Home in the next few weeks. You can think of it as Living in Dryden is Home. When I was fifteen my maternal grandfather passed away. He struggled through most of 1990 and 1991 with the complications of diabetes. I watched as he grew weaker and weaker until the late winter when he said good-bye. At his wake I sat in the front row watching the column of family members and family friends pass before me. I noticed my next door neighbor Mr. Smith was in the line. In those days we were living in Berlin, Massachusetts and the funeral home was about an hour away in North Smithfield, the hometown of my mother. "Did Mr. Smith know Dziadzu (djah-djoo, Polish for grandfather)?" "Did Mr. Smith know Babci (polish for grandmother)?" "Why was Mr. Smith at the wake if he didn't know Dziadzu?" "He wasn't there for Dziadzu. He was there for us." It took me a long while to understand that we come together in death to support the living as well as remember the people that have passed. By the time my maternal grandmother passed away in 2000 I understood and the impact of having those who never met her in person around for my mom and her two brothers. EDITH MARTHA STELICK DRYDEN - Edith, age 84, also known by many as Grandma Stelick, died Thursday, May 17, 2007, peacefully at home from heart failure. Edith was born on April 21, 1923 in Elmira, New York, to Mabel Bell Comfort and Jeptha Oliver DeGraw. Edith loved life and was a kind person to all. She enjoyed visiting with people (especially babies), talking with and watching animals, and enjoying nature. Grandma was known for her fabulous cabbage rolls and for making yummy sweet treats for her family to enjoy. Grandma Stelick (Edith) was a friend to all and will be dearly missed. Her family was the center of her world. In fact, a recent goal of hers was achieved when she made the 6-hour round trip car ride to Buffalo on May 11-12, 2007 to see her oldest grandson, Brandon, graduate from college. An added bonus of this trip was for her to see the engagement ring that Brandon had recently presented to his fiancée, Ellen. Edith attended Candor Central School District. She resided in the Dryden area for over 50 years. Edith retired in 1988 from the former Harold's Army & Navy store that was located on The Commons in Ithaca, NY, to be with her grandchildren. She enjoyed this job as it allowed her to meet and to help customers with their purchases and find clothing in the correct size. Her former employment included Treeforms, Morse Chain, Smith Corona, and National Cash. For the last 9 years, Edith resided with and was lovingly cared for by her son, daughter-in-law and grandchildren: Stephen, Jr. and Lisa and grandchildren, Brandon (Ellen), Travis, Trevor and Kendra. She is also survived by her daughter, Sharon (Tom) Keegan and grandson, TJ. Edith is preceded in death by her parents; and her sister, Betty. Memorial Services will be held at 2 p.m., Monday, May 21, 2007, at the Perkins Funeral Home with Rev. Allan Kinney officiating. Burial will follow in Willow Glen Cemetery, Dryden. Edith's family will be present Monday from 1 to 2 p.m. to receive their friends at the funeral home, 55 West Main St., Dryden. Memorial contributions in Edith's name may be made to Dryden Ambulance Fund, PO Box 397, Dryden, NY 13053; or Southworth Library, PO Box 45, Dryden, NY 13053. www.perkinsfuneralhome.com. Other things happened today in Dryden, roads were repaired, gardens were planted, writers and potters worked, but this is what I'll remember from today. Today's Ithaca Journal featured an article and pictures of Primitive Pursuits, located at 4-H acres in Dryden on the cover of the Local section. I first heard of Primitive Pursuits through a friend of a friend, but only had a vague understanding of what they did. I saw a little more of their activities at Earth Day at the Ithaca Farmer's Market. Two weeks ago, at the May 2007 Dryden Town Board meeting the Dryden Youth Commission made a presentation. The presentation included David Hall, the Dryden resident who created Primitive Pursuits as well as a few students enrolled in the program. Center: Tim Drake, center, program director with Primitive Pursuits, ignites a tinder bundle made of cedar bark Saturday during Primitive Pursuits Day at 4-H Acres in Dryden. Drake, along with several volunteers, used a giant bow drill to create hot coals that were placed in the tinder bundle to produce a fire without the use of matches. Primitive Pursuits is an environmental awareness program of the Tompkins County Cooperative Extension. Saturday's events included demonstrations and hands-on teaching of skills such as tracking, bow making, hide tanning, and making turkey calls, bone tools and stone pendants. Along with teachers from Primitive Pursuits, the event included instructors from several wilderness schools. Top right: Eric Kincaid, left, Chris Watrous and Matt Noonan perform. Bottom right: Tim Brown, center, helps Elena Fine, 8, left, make a bow as Finn Rosenfeld, 10, checks out the tension on his handmade bow. Dryden Dairy is coming soon! On Saturday, June 9th Dairy Day kicks off with a parade at 9:30am followed by events from 10am to 3pm in the Village of Dryden. Last year I put on my hat and marched in the cold rain with fellow Dryden Democrats, Simon wrote about it here and posted a picture of me here. The year before, I'm told was very hot and sunny, the opposite of 2006. I hope for warm weather this year as I'll be marching (or walking) again with the Dryden Democrats. In today's Dryden Town Talk Cathy Wakeman reports on the theme of Dairy Day, the Bike Rodeo sponsored by Sertoma last weekend, the upcoming golf event (also sponsored by Sertoma), tonight's 50th anniversary program remembering the 1957 100th anniversary of the village of Dryden, and finally the Dryden Guest Artist series which continues on June 6th (the day of Cathy's next column). Cathy asks that you contribute to Dryden Town Talk via her mailing address or email address, cwakeman@twcny.rr.com or 23 Lewis Street, Dryden NY 13053. There's nothing like an old comrade to straighten you out. In the last Dryden Town Talk, I erroneously shared the Dairy Day theme. Hearing rumors of another theme rumbling about town, a quick call to Kim Schenck, this year's parade coordinator, set me straight. The theme shared in the last column is actually for the Grange float, as National Grange celebrates their centennial this year. The actual theme for this year's parade is “Hay, Hay, It's Dairy Day.” Visions of scarecrows and hay bales automatically began dancing through my head. So the challenge is out. Groups are encouraged to get out their trucks and tractors and hay bales and participate in the 23rd annual parade, to begin at 9:30 a.m. on Dairy Day, which is Saturday, June 9. Dairy Day events will run from 10 a.m. to 3 p.m. There are cash prizes in two categories and for the best use of theme. Register your float online at www.drydendairyday.org or by calling Kim Schenck at 844-4143. The Sertoma Bike Rodeo last week was yet another in a long line of wonderful community service events provided by this dedicated organization. More than 30 brand new bike helmets were professionally fitted onto young heads by Village Patrol officers Kurt Soderholm and Tony Bellamy. Participants of all ages were able to test and refresh their bicycling safety skills in a course of five stations. Fifty-three children participated in the event. Two bicycles were raffled at the rodeo, and Duran Joyce and Nadia Schevshenko were the fortunate winners. Thank you to Sertoma for again making this event possible. Sertoma now turns its attention to its third annual Golf Tournament. The net proceeds of this event will benefit the Dryden Historical Society. Teams and individuals may register for this four-person captain-and-crew event, which takes place on Friday, June 29 at the Elm Tree Golf Course at 283 Route 13 in Cortland. The registration fee of $75 per participant includes 18 holes of golf, riding cart, a steak meal and prizes. The prize list currently includes a new car from Stafford Chevrolet and airline tickets from AAA-Stone Travel. For registration information, call Charlie at 844-8796. Thanks to the Tompkins County Rural News and photographs by Ross Sherman, the Historical Society will share records of this event. The public is invited to bring photos and souvenirs to display and stories to share. The doors of Dryden Village Hall will open at 6:30 p.m., with the program beginning at 7 p.m. The program is free and open to all. For more information, call Gina Prentiss (844-4691) or Mary Hornbuckle (898-3461). The Dryden Guest Artist Series will cap off another excellent year of sharing music with students and the Dryden community on Wednesday, June 6, as Los Bandidos, featuring Paul Merrill, comes to share its brand of “incredibly danceable” salsa and Latin music at the Dryden High auditorium. Dryden Central music students are welcome to join the band for a workshop at 6 p.m. in advance of the 7 p.m. the concert, which is free and open to the public. In other news, a Brooktondale man escaped the Dryden Town Court after he realized he couldn't afford the $200.00 bail. He is at large. He was pulled over on Dec. 7th and issued a ticket for aggravated unlicensed operation in the 3rd degree (knowingly operating while suspended, revoked or withdrawn by the commissioner). In other news, the Dryden Planning Board has an open position. Simon notes, "The Planning Board is more and more critical as the zoning process moves forward and Dryden develops further, so I'd encourage anyone interested to apply." For application information, contact Environmental Planner Dan Kwasnowski at 844-5607. Dryden Dairy Day will be held Saturday, June 9, beginning with the parade down Main Street at 9:30 a.m. and activities in Montgomery Park until 3 p.m. Early registration for booths at Montgomery Park is $15 if received by May 25. Late registration fee is $20 and will be accepted until June 1. Registration fees are non-refundable. Registration, questions and information can be found at drydendairyday.org. Booth numbers will be posted at the gazebo in Montgomery Park by 8 a.m. on Dairy Day. Stay up to date with Dryden at the Ithaca Journal search site about Dryden. This evening I had a slice of pizza from Pizza Aroma (Green and Cayuga Street in the city of Ithaca) for a late in the night dinner. While the slice (Hawaiian - ham and pineapple, the pineapple because it is naturally there, the ham because Captain Cook left lots of pigs on the island when he "found" it) was reheating I wandered next door to Sam's Wine and Spirits. Sam's is a small locally owned business, owned by Dryden resident Doris Nitsios. Doris' late husband Sam owned Sam's as well as the Candlelight Inn in the village of Dryden. When I walked by on my way into Pizza Aroma I saw Doris talking to the manager of Sam's. Doris brought me up to date on the fun nitty, gritty details of owning a bed and breakfast in Tompkins County - especially on graduation weekend. I thought about today's Ithaca Journal article about B&B's in the area. See it here. When I made it back to my house I enjoyed my dinner while reading through this week's Dryden Courier. I read an opinion article fellow town board member Mary Ann Sumner submitted about the Cayuga Press Loan. I hope Mary Ann post a copy of it on her Five Wells blog or the Dryden Democrats blog. I also noticed at the end of Matt Cooper's Around Dryden column a request for Lilac locations. Now that my own lilacs have come back into bloom, I've noticed lilacs everywhere I go. Earlier today I was at Lee Ginenthal's house, he's a customer of 544 Productions and his business is Der Rosenmeister - he's a purveyor of antique and modern roses (his site is here: http://www.derrosenmeister.com/). I asked Lee a lot of questions about roses and owning a nursery, but ended with a question about the colors of Lilacs. They range from white to light purple to dark purple. 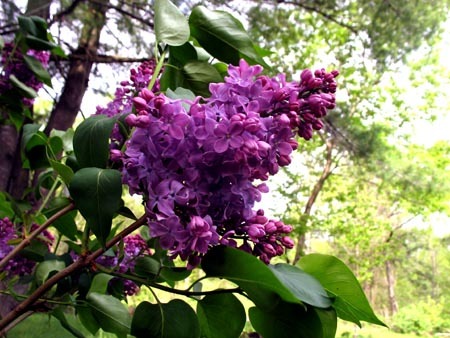 I will end with a couple final notes, first, here is a picture of my own lilacs from my yard last week, just in case Matt Cooper can't find any real ones around - here's a virtual lilac. You can almost smell the aroma. Poem: "Stealing Lilacs" by Alice N. Persons, from Never Say Never. © Moon Pie Press, 2004. Reprinted without permission.